In the 18th century you couldn’t choose to study botany as a subject at any Swedish university. If you were interested in botany, your only way to learn more was to study medicine. That’s what Linnaeus did. He practised as a physician for several years during the 1730s and 1740s and amongst his patients he treated the Swedish queen Ulrika Eleonora. When he became a Professor of Medicine in 1741 he interrupted his medical practice and started teaching medicine and botany for the students in Uppsala. In that way he learnt about medicinal plants, both as a result of his interest in botany and through his medical studies. Many of the medicines used in those days were medicinal plants. Frontispiece and title page of Linnaeus’ Materia medica, a compilation of useful medicinal plants. In 1749 he published Materia medica. That’s a Latin term for medicine and the book is a list of plants, minerals and animals that Linnaeus considered could be used in medicine. During the first half of the 18th century in Sweden a book from 1686, known as Stockholm Pharmacopoeia, was used as a list of known medicines. It was based on similar medical books mainly from Germany and Austria. Since Linnaeus thought much of the contents of the Stockholm Pharmacopoeia was useless for treating ailments, he modernised the list and motivated his choices in his Materia medica. This and his two subsequent books were used in the teaching of medicine and pharmacology for several decades all over Europe (which at that time was considered the whole world). Linnaeus also wrote several theses on medicines and pharmaceutical control, for example how to determine the quality and usefulness of medicinal plants by using taste and smell and also to make sure that the product was not too old. 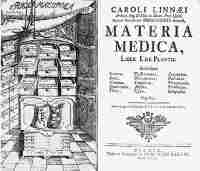 Linnaeus’ Materia Medica also acted as a jolt to the Swedish medical authorities that it was time to modernise medicine and just over twenty-five years later the book Pharmacopoea Svecica was published in 1775 – it was the first national Swedish Pharmacopoeia. Linnaeus’ old medicine cabinet is today kept at the Linnaeus Museum in Uppsala, Sweden. 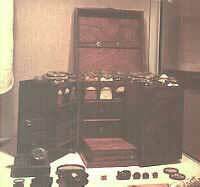 It contains some of the most important medicines of that time and was used for demonstrations to the medical students. In his botanical garden, Linnaeus kept all the important medicinal plants that could be grown in Sweden as well as many plants that he wanted to observe as a botanist. He used the garden to demonstrate medicinal plants and botany to the medical students. Among the plants that he cultivated for medical purposes, the following are worth mentioning: the opium poppy, valerian, deadly nightshade, sweet wormword and camomile. Linné, C von 1725 Örtabok. Stockholm. (Nytryck: 1957, Almqvist&Wiksell, Uppsala).